That tweet was made on the same day that an article by BJP’s minister for Women & Child Development, Maneka Gandhi came to public light and received much condemnation. This was published in Firstpost with the title “Makar Sankranti, much like Bakr-Id, is a day of cruel animal slaughter throughout India”. A day of ANIMAL SLAUGHTER? Apart from being a collection of outright lies it exposes Maneka’s Sickular disgust for Hindu festivals, traditions and cultures. From a Hindutva govt, a minister of ModiSarkar consistently abuses Hindu traditions. This is not new for Maneka. Trivia: the name “Menaka” (who was a Sikh) was changed to “Maneka” because IndiraG took a dislike to a name originated from a celestial nymph in ancient Hindu stories. The contempt for Hindu mythology seems to run in the Gandhi family. Anyway, let’s get quickly get through some of MG’s silly acts in the recent past. Makara Sankranti is the same as Bakri Eid? This is nothing but extreme contempt for Hindu festivals and traditions. Neither Jallikattu nor Kite-flying on Sankranti mandate animal slaughter in anyway whatsoever. 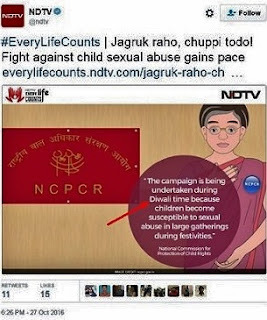 But MG joins the vicious anti-Hindu agenda of Sickulars and NGOs in trashing our festivals with false equivalence. There is no bull slaughter during Jallikattu. People don’t fly kites to slaughter birds. If there are injuries or deaths, these are purely unintended accidents. MG also writes "Young boys bite off chunks of bull's skin during Jallikattu". Unbelievable! A bull’s hide is too thick and strong for a kid to sink his teeth into, especially with the bull running around. I suspect even adults won’t find it easy to chew off a bull’s skin. Must practice on your shoes first, I guess. I wonder where she got the figure of 3 lakh birds being killed every year. I searched all over and could not find such a figure and would be happy to get a reference by anyone. True, birds do get killed or injured but not in the alarming proportions claimed. And these are unfortunate accidents and not warranted or mandated by the festival as it is during Eids to which MG compares Makara Sankranti. Yes, the threads can be made less dangerous. But a bit of potent glass powder is inevitable. Without a certain sharpness in threads, Uttarayan kite-flying would be like Spanish bull-fighting with the Matadors without a lance. There have also been injuries to two-wheeler riders with stray kite-strings cutting their throats or arms. There have also been stray cases of deaths due to throats being slit by the sharp strings. But here too, the Gujjus have devised ways to protect themselves rather than do away with sharp strings. 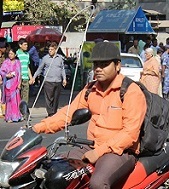 The pic shows how an ordinary metal wire-shield has been innovated and fitted into two-wheelers to protect the rider from the threads. 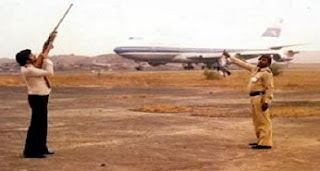 What does MG have to say about birds being routinely killed over airport skies for safety of aircrafts? Hindus unite by their social customs, traditions and festivals. 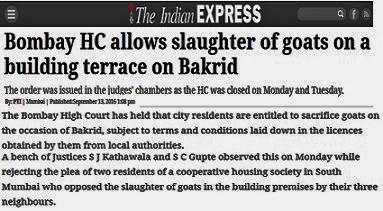 Hindus would like to see a petition in court by ManekaG or a law by her that bans animal slaughter by Muslims or introduces at least painless slaughter. And also, a law that this should not offend neighbours or turn our streets into gutters of blood. It is because there are no guts in her, the BJP or any political party that she must stop “Monkey-balancing” with false equivalences. The Jallikattu ban has turned into major protests in Tamil Nadu. Maneka, her party, the govt and the judiciary should take sentiments of people to age-old traditions before embarking on bans. Reform is possible, bans will fail. And such reforms must be done WITHOUT association of anti-Hindu vested interests or foreign NGOs. Is there a way to petition to the govt or the BJP to throw her and her son out?? Would love to support if there is such a petition going. She has been nothing but a nuisance. Hobnobbing with Congress and AAP trolls, making inane statements, ignoring reality. BJP and the central govt. would be better off without both the Gandhis. Oh, and I wanted to add... animal sacrifice is really made by all non-vegetarians( Non-brahmins) two days after Sankranti. As per traditions, all meat eaters From AP/Telangana at least, forgo eating meat for an entire month before Sankranti, starting Dec. 15th. The vegetarians give up onions, garlic, and white pumpkins. Then, AFTER sankranti, on the day of Mukkanumu, the meat-eaters offer sacrifice to god and eat meat as prasaad and the vegetarians cook onion/garlic. This has been an age old custom. Not sure of all of south India follows it. Hindu traditions have been changing with times getting more compassionate. Sacrifices of animals and humans has been a very common feature of celebrations across the globe in various societies though Islam still continue while many have stopped and like Hindus tokenism of sacrifice is there by way of cracking a coconut by hitting hard on the floor instead of a real animal. During Sankranti puja "wheat with sugar in ghee" is roasted in a wok. This is given a animal shape in a plate which is then cut through with a coin/knife. So sacrifice must have been taking donkey centuries back but compassion for living beings amends have been made in many religious rituals. The next hit will be bullock cart racing taking place annually in some states. I agree in trying hard to break political parties from the Muslim vote bank NDA is totally in mute mode like the three monkeys depicting - see nothing hear nothing speak nothing. Great analysis as always, thank you. Has the nasty, vicious, slanderous article received the approval of our Prime Minister Shri Narendra Modi ji and BJP? Their sphinx like silence and lack of action against this Insensitive minister points to the fact that the article has their blessings. Otherwise she would have been out of the Cabinet. These articles get all the Hindu's upset with Modi Sarkar, if the government does something then all the sickular media will attack Modi Sarkar. Given the fact that the Indian masses are mostly morons, the situation will result in BJP losing the next election and the country back in the hands of anti-nationals like the Congi's and their ilk. The Hindu's over a long period mastered the art of complaining, they eloquently talk about how they have been wronged and the injustices handed to them by the minorities and media, but they never unite for any cause at a national level, like the opposition does. Tamil Nadu is showing the way on how to unite for for their cause and it is a welcome change. 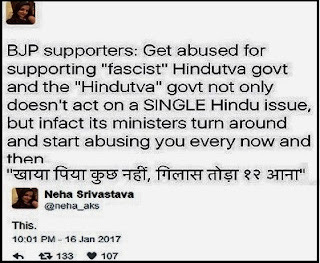 Hindu's stop complaining and attacking Modi Sarkar, get your act together and organize at least as well as the opposition. The strongest asset the opposition has is their unity. Flood the social media and your neighborhoods with your perspective. Modi Sarkar though not anywhere near perfect is the best thing that has happened to India in a long time, don't weaken it. Agree. Even the incidence of dowry have come down not because of stringent laws but because of the social change brought about in the Hindu society. Lokmanya Tilak wanted bring about the change in the society by making the people realise their wrongs. He disagreed with Agarkar that the Hindu society should take recourse to the laws being brought by the British. Also to remember is that the Hindu laws were codified only after Independence and Hindus whole hearted accepted it. There was. no violent protests on Monogamy being introduced as law. The societal change has to be from the society and not imposed. 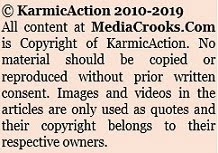 Sir, @mediacrooks, thanks for mentioning worldvision along with peta. 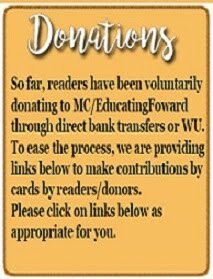 I am mortified to admit that before i became sm savvy, i have ignorantly donated 1000s of rs of my hard earned money to these abominable ngos which are using my money to destroy my faith and culture. Do let's put a stop to these treacherous forces. Sir, a very well written article as always. Do you seriously think that we could have expected anything better from this brain dead dynastic female?? MG and her son are an embarrassment to the BJP and its a pity that is not being recognised. What is the role they are playing to build the image of BJP as MPs. Having a "Gandhi" seems to be pitfall in BJP Govt. This dumb vicious woman & her kid should be ousted. Maneka's (Women welfare minister) friends in PETA are only known for the naked Women pictures and nothing else. It is an illusion to thin BJP is pro-Hindu or has a Hindu agenda! On the contrary, BJP is as hypocritical as the CONgress! 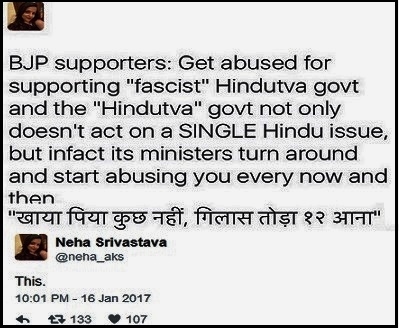 Not a SINGLE act of BJP can be cited, wherein it has tackled the anti-Hindu acts/forces operating in the country! Even if they did, isnt that what they would have done in their natural habitat.Do bisons(same family) in Africa not run in water when attacked by lions? Isnt the need to run fast provided by Nature as a mechanism of survival to these animals? Then why is it a big deal if done in an festival event. Very well written balanced article. An eye opener and could give directions to courts and government to enact reasonable laws. Our politicians are real bulls who need to be tamed correctly. Thought provoking article as always. But the issue is how many such articles will be required for us to unite & rein in these sold out haters from doing more damage to our traditions & culture? Menaka, wife of Vishwamitra, who gave birth to the beautiful and right minded Shakuntala - and thats how we get an insight into Kanva maharshi (probably the first single father of an adopted child) who then gave birth to Bharata - after which this "khanDa" is named. One should be mighty proud to name their girl Menaka, and very well versed in Hindu scriptures too. Menaka was so learned, so beautiful such a fine balance of the tri-gunas, and so talented, such a balanced thinker. It has become a habit with Indian Judges to pass judgments on subjects that are beyond their purview. A judge is a mindless person who weighs the best of the lawyer arguments & choose the one suits him best & delivers it as his judgment. Judges have lost the discretion of logic. While they have backlog of million court cases, they are taking up non-issues as issues & wasting time. In every village there exists certain category of vagabonds & goons, who need to be kept busy in wrestling fights or bull fights else they will become burden on the village & society itself (Dawood Ibrahim is a case) if these bull fight sports are taken away, then these goons will be after women bringing distortions into society & increases crime rate. By keeping them busy in sports, fightings skills are harnessed, to fight any invaders tomorrow. With everyone moving to cities to make a living, the village culture is lost, so does its meanings. At the same time, none cares for the amount & quantity of animals killed to become food for non-vegetarians. South Indian media channels have 24 x7 scrolling lines of chicken birds - with & without skin priced at Rs. x y z per kg. PETA promoters themselves are first rate non-vegetarians & do not see anything wrong in that. This is nothing but extreme contempt for Hindu festivals and traditions. 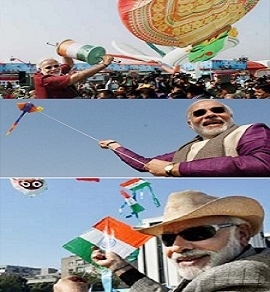 Neither Jallikattu nor Kite-flying on Sankranti mandate animal slaughter in anyway whatsoever. Guys/ Ravi please don't ignore the sinister twist now being sought to be given by the mainstream commentariat which we know as secular liberal to the Jallikattu protests - that of tamil sub-nationalism which is being ignored and suppressed. I was very surprised to seek an edit in the TOIlet paper arguing about the misplaced and unenforceable activism on jallikattu. But no such courtesies were extended to Dahi handi in Maharashtra, kiteflying in Gujarat, holi in northern india, and Diwali all across India. What has happened I guess is that the relentless assault on local Hindu traditions have been continuing one after the other on one pretext or the other which you have highlighted and backlash has been building up. In Jallikattu this has come out. But the MSM commentariat has now sought to twist this into Tamil sub-nationalism, consistent with their agenda that Unity of India must be undermined from within playing up faultlines and divisions.I have seen 3 such in Firstpost - one by some T.S. Sudhir, one by David Devdas or something like that and another by G. Pramod Kumar, all consistent now in playing up tamil sub-nationalism. these guys are smart, deviously so. But only if we do not spot their game and let it go on unchallenged. This post has been doing wonderful job till now. Keep it up.